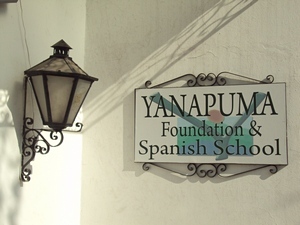 Yanapuma Foundation and Spanish School was begun in September 2006 by a group of Ecuadorian teachers with the help of two "gringos," with the mission of promoting sustainable development in indigenous and marginalized communities in Ecuador (read about our work here). We adopted a "social enterprise" model from the start, setting up the Spanish school to provide core funding for the work of the foundation. We also integrated volunteer activities, working with individual volunteers and groups of volunteers, placing them in projects and communities that need help in their development. It was vitally important for us from the very start to develop a professional Spanish school, to distinguish ourselves from the competition not only by our vision and mission, but by our dedication to providing the very best in Spanish language tuition. In contrast to most other schools we have spent considerable resources on our academic and methodological development, and on putting into place a system of class planning and ongoing student evaluation to provide a permanent record for each student of their progress while studying with us. During these years we have all worked incredibly hard to manage the development of our organization in the face of a variety of challenges. We have often observed to others that the reason we have been so busy is that we have actually developed three successful organizations at the same time - a professional Spanish school, a thriving volunteer department, and a foundation achieving positive results at a grass-roots level. 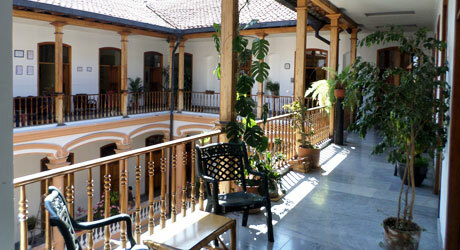 Our Spanish school in Quito is located in a traditional colonial style building in the heart of the historic center of the city, close to all the principal tourist attractions of the city. With the classrooms on the third floor arrranged around a central courtyard, the school provides an inviting environment where students can feel free to relax and spend the afternoon studying, chatting or using the internet, giving the school a lively and laid-back ambience. Our Spanish school in Cuenca is also in a traditional building, close to the very heart of this historic colonial city, only two blocks from the Parque Calderón and the Cathedral. Students are also welcome to use the school as a base to relax and enjoy a coffee, use the internet or study while they are not in class. We have striven to excel in every area of our organization, offering not only the very best in Spanish language tuition, but also to develop efficient and transparent administrative processes that make it easy for students to negotiate the financial and organizational aspects of their time in Ecuador. From the moment of receiving the first email inquiry we aim to respond quickly and completely to students' questions and issues. We regularly survey students while they are studying with us to ensure that all their needs are being met in terms of their classes and their accommodation. Our teachers work with each student to create a lesson plan at the start of their individual classes, and this is reviewed by our academic director to ensure that it is apt and well defined. Each week the teacher completes a report on the student's progress which is also reviewed by our academic team to make sure that the student is progressing satisfactorily. These reports form a permanent record of each student's learning which can be used as the basis for a report for credits by colleges and universities.